3 Bathrooms with washbasin, bidet, bathtub, shower and toilet serve each floor. There is table tennis, billiard, board games and boules. The pool is not heated in winter but is located to the south, in a closed area that allows you to go for a swim in October, of large dimensions (11x5 m) as well as a Spa bath on the stairs. It has a pool house and toilet surrounded by three-hundred-year-old pines. Sun beds and sun umbrellas are available. The property is a large manor type house with many sleeping options. Grand and aging gracefully. We had a full house of 22 persons and the property suited our needs very well. The large number of bedrooms gave us the flexibility to place family members together and give couples their own room. The kitchen was large and well enough equipped. The gardens were ideal for an outdoor party during our stay and had enough tables and chairs to cater for 30 people and lit at night. I imagine that arrangements would need to be made to cater for larger events. The pool area was very suitable and serviced daily. However there was only a few sun loungers and could be improved with another 6-8 loungers. Having three bathrooms was convenient but showers over the bath and no way to prevent splashes meant swampy floors. Also although linen was supplied there was only 12 towels to be found in the house. We recommend arranging towels in advance or bringing your own. Our website booking said we could arrive at 4 pm and leave at 11am, however we were instructed locally that access was at 5pm and had to be out at 10am. In actuality it is only a 6.5 day rental and the first day is only an evening. Overall we were very pleased with our stay. The house is not luxurious but quite grand. Tired in places but forgivable. The weekly rental is fair. 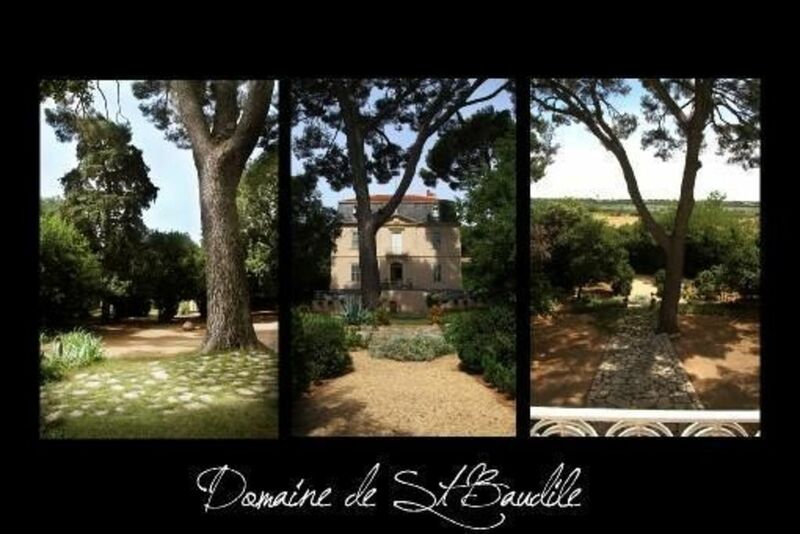 Having rented something similar in Provence, the per person cost is comparable and this property is larger overall. The location is ideal to visit the beaches and sea ports with good access from Monpellier Airport and train station. Great house ,garden and location. We had our bi-annual family (12adult + 6 children) holiday at Christine's Domaine Saint Baudile , 06 - 13 August 2016.
we had a great time, the garden and pool are amazing and children loved it. the house and facilities are clean and comfortable, also the BBQ and the al fresco dining. somehow everyone found it better than the listing. the super market very close also the beach at Pilou. we didnt try the local restaurant but the pizza take away was tastey, Christine very charming and helpful....thank you! we hope to come back. The house was dirty, broken screens in Windows, no screens on the top floor, no windows in one bedroom, broken floor tiles, dead shrubs, bats in the house, small kitchen with only 6 chairs and disgusting bathrooms where the 1 shower leaked all over the floor and the upstairs bathroom smelled like sewer. The grounds were dirt with no grass. The pool was nice but had dirty outside tables and broken. And to top it off the house is located down the road from a prison. Would not recommend this house. Not good for older people as the steps outside are all uneven and cracked. Very disappointed. What else,i know that the manor is old but it is make for persons who love old stones.I think that you can go in new houses but i don't understant the enterprise of demoliton.When you want housekeepers i put it when you said that it have Something wrong in the bathroom we change but you have leave a tall internet bill more of 400euros in 3 days for movies' kid and you broken a lot of thing that umbrella sun that you have leave open when you go to bed:250euros.What more:chewing-gum plug on the amrchair,blood in all the linen etc.Now i have shooting in all this ugly manor the photograph are crazy????????? great location, spent a rather relaxing holiday! very friendly host, thank you christine lapeyre. Located in the Languedoc, in Hérault, in 1 hectare of parklands, it gives the opportunity of receiving guests for marriages or having a beautiful beach holiday on the seafront. Montpellier is an important cultural centre where you can listen to classical music, visit the museums or visit the medieval centre of the town, where the old town houses are numerous and where is located one of the oldest faculties of medicine in the world. The Promenade du Peyrou, the Place de la Comédie and the Arc de Triomphe designed during the reign of Louis XIV make this town one of the most beautiful towns of France: a small Paris.